Replace your muffler with a SpinTech. 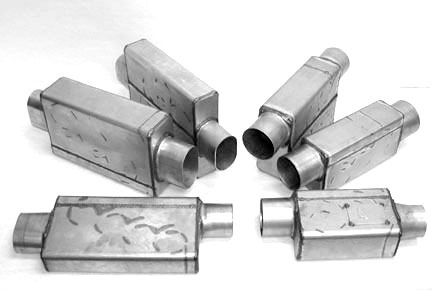 SpinTech Mufflers are individually welded with a custom design and unique sound in mind. Our mufflers give your vehicle that high performance racing SOUND that no other exhaust manufacturer can duplicate and we offer a greater range of flexibility in muffler customization than any other exhaust manufacturer! SpinTech is the only muffler manufacturer to offer a complete line of oval inlets/outlets accommodating low-profile or hard to fit spaces, ranging from 2 1/2" to 5" oval. 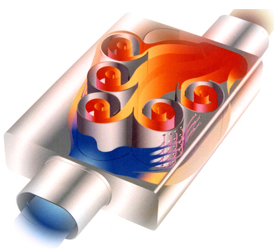 SpinTech's unique patented design provides maximum performance for today's modern engines. Its all done by means of a spin sound trap, which captures sound vibration (noise) and turns it into heat within the muffler case. 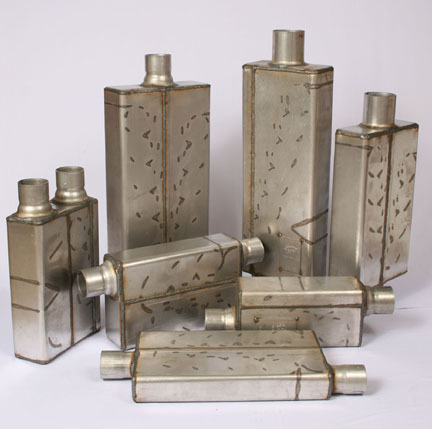 SpinTech mufflers are individually crafted with welded construction. We use no packing or moving parts that will wear out. A SpinTech muffler is durable and will sound the same throughout its lifetime since no maintenance is required for a muffler without packing. Be sure its a Genuine SPINTECH Muffler. SpinTech also offers a compete line of all necessary oval transitions, tubing, elbows in both planes and oval tips. You name the combination and we will customize it for you. If you aren't sure which muffler to order, give us a call toll free (888-550-7746) and our knowledgeable sales staff will help you pick out the right muffler which will create great sound and more power for your vehicle!